While I was out driving this morning I saw something, a tree, that literally took my breath away. 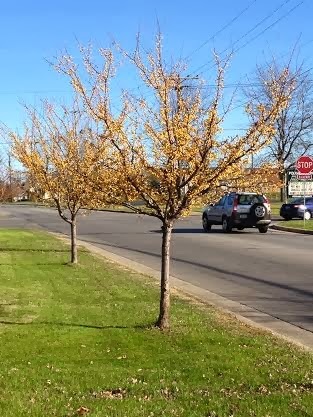 It was a small tree lining the edge of a somewhat busy road-- not the type of tree, or in the space, you would expect for a "wow" kind of moment. The sky was clear blue and frost covered the ground and branches. It was one of the first mornings this year when the temperature dipped below 30…and while I'm not always a cold weather fan, I do love a cold sunny day. 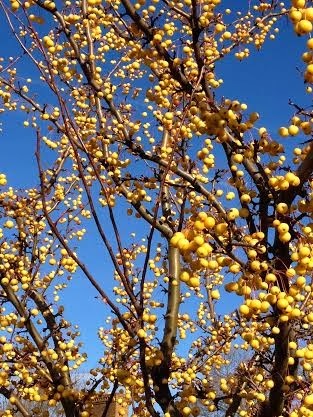 most exquisite little yellow berries. I was struck by how beautiful they were and also by the fact that I had never noticed them before. Have those been here all along? I've driven this road hundreds of times in my younger years and as an adult and I've never noticed how beautiful they were before. 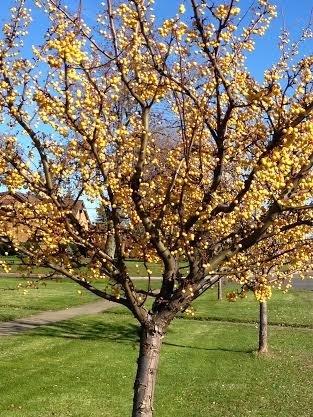 I've never noticed a tree with yellow berries at this time of year before. I almost laughed aloud. How clever of you God, I thought. I always notice something new at the changing of the seasons. As I continued to drive with my senses now heightened I observed tree after tree…With most of their leaves having fallen to the ground it was easy to see the branches and how they all seemed to be pointing straight up towards the sky. Almost as if they were in church, singing a song of worship, with their hands stretched out towards God. Of course…all of nature…pointing us back towards God…when we take the time to look and appreciate it in all of it's incredible detail. It is part of the reason that I love this time of year…I love the transition between seasons. If the trees simply stayed green and lush all year, I would enjoy them, but I would start to forget to notice them. They would become such a consistent part of the backdrop of my life that I would take their beauty for granted and simply drive by them more times than not. When they change…when their leaves transform from green to gold, and then begin to fall; when their branches stand bare and glisten with frost and snow; when the buds re-emerge and then the leaves start to grow again…then we notice. And so today I am thankful for the changing seasons. I am thankful that I live in the Northeast where I get to appreciate God's creative and genius design that perks up my senses every three months, just as I start to fall into a stupor and stop noticing. On that topic, but off the topic (bear with me), Ava asked us to change the positioning of some of our living room furniture this weekend. I obliged because I love her creativity and her spark to want to change things up sometimes. I've gotta tell you, I'm LOVING the new placement of things. It has totally reopened some space in our living room and everyone has been dancing and doing cartwheels and enjoying the new traffic flow. I'll snap some shots when they are all here dancing and post them later. Life Lesson: When things start to get dull, take a walk to notice the trees and move your couch to a different place. I kid you not, it added such a perk to our weekend! On mornings when I've awoken at least a few minutes before the little ones, I quietly tip toe downstairs, find a warm blanket and curl up into an old corduroy chair in our living room. I spend the few minutes I have saying a prayer or reading a verse from a devotional or my Bible, and write a note or two in my journal. These moments are anchors in my day. However, the quiet, uninterrupted thoughts are far and few between these days. As a matter of fact, the moments in that chair are far and few between as we've found ourselves in the midst of a season of sleepless nights; a baby nursing, older children with ear infections and bad dreams that require tender hugs afterwards. I don't mean to grumble, but it's feeling like a L-O-N-G time since a solid night of sleep has allowed me to be refreshed in the morning hours. I'm a tired momma lately. And from the chair, when I make it there, there is a tall tree that can be clearly seen through the windows at the back of our living room. I've watched that tree in morning hours...on snowy days, and rainy days, sunny days and windy days. I've watched that tree brave the elements of all of its seasons. I've watched it tilt and bend in the wake of strong gusts and blossom and sit still and strong. I've watched the leaves come and go, change from buds to barren, from green to golden. 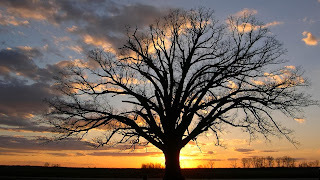 I often watch that tree and am reminded of the verse is the Psalms... (She) is like a tree planted by streams of water that yields its fruit in its season and its leaf does not wither. In all (she) does she prospers (Psalm 1:3). I am reminded that every season is part of a bigger picture. That no matter what season we are in, if we root ourselves in Christ, we posses a strength and a nourishment that gives life to our daily details in every season of our lives. This post is part the 5 Minute Friday link up. To join in the fun check out Lisa-Jo's blog here! I look around and see things scattered everywhere. School papers. Dishes. Shoes. Construction paper. Crayons. Clean diapers. Dirty diapers balled up and still sitting on the floor. Towels. Socks. Candy wrappers. Hair bands. Butterfly wings. Recipes ripped from magazines. Bottles. Scraps of toast from breakfast. Mildewing pumpkins. Incomplete baby books. Unstarted baby book. Water glasses. Week old newspapers. Yes, you know the list could go on. And on. And on. And on. The items, each of them, trigger anxiety in my churning mind. Items to do. Items to add to my calendar. Items I don't want to forgot. Items to be put away. It's so much doing, running, striving, trying, exerting energy to get it all done. This morning, during a few moments of quiet in the car as I drove to a doctor's appointment a song clicked onto the CD player. A song of worship. With lyrics that say, "I lift my eyes up, to the heavens. Where does my help come from?" Eyes upward. Not outward. Why do I always forget that? When we lift our eyes upwards, when we focus on God, when we offer Him worship and talk to him and ask him what he has in store for us on this day, the mental focus shifts. It always changes...from running to resting. Rest doesn't always mean to stop completely, I remind myself (even though that would be nice some days!). It sometimes means to stop momentarily to regain your composure. To shift your focus from the lots of little things that can bring you down, to the bigger, more important picture. 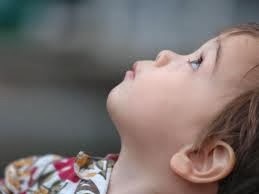 When I lift my eyes up...to the heavens...to God...my soul takes a deep breath. I realize that all of the tasks that sit before me, the daily, sometimes mundane tasks, are all a part of the plan He has for my life. When I consider them in that light, they suddenly have purpose. Then, somehow, magically, the kind of magic only God can do in my naturally anxious mind, when I look back down towards all that is in front of me I find myself laughing. I chuckle and smile and think about that silly Phyllis Diller quote that says, "Cleaning your house while your children are young is like shoveling before it stops snowing." Now that's a bit of advice this Buffalo momma can relate too. I find myself realizing that these items that surround me EVERYWHERE are the pieces of the beautiful and blessed life that we live. I am a blessed woman. The mess is a sign that I am blessed. And so I sat down to write this post. I had a very few minutes of free time and my choices were run or write. It used to be that I could fit both into my life...lately I'm increasingly finding that it's one or the other and so I must choose. Run or write? The answer is often different depending on the day, but today the running felt too much like the crazy, hectic striving. The writing felt more like rest. And so I'm writing my words, hoping they reach your heart today. Hoping they remind you that you are very blessed in many ways. That your mess is a sign that you are blessed and blessed abundantly. Which seems like a very appropriate thing to remember in this month of Thanksgiving. Our third daughter's middle name is Grace. Aubrey Grace Littlewood. We did not give her that middle name simply because we thought it was pretty. Although I do think it is an incredibly sweet name. It actually started as a joke between Scott and I....before we even knew she was a girl. "If we're going to have a third child...if we're going to have a third GIRL...we're going to need a LOT of grace around this place!" We joked about the drama...the kind of drama that can only be explained by many females living under one roof...and said many times..."This one better be a boy!" Of course, now that she is here, we wouldn't have it any other way...But I will say that I have already calculated that there will be at least one year where we will have 3 teenage daughters all at the same time...19, 17 and 13...and oh my heavens will that be a crazy day. 365 days actually. And oh my heavens will we all need to offer grace and space to one another. The truth is, family dynamics and parenting are incredible training grounds for learning and practicing grace. I must offer myself exorbitant amounts of grace for all that I lack as a mom...the times when I lack patience, when I am not a good time manager, when I overreact to something small, when my house is way messier than I could have ever imagined, when my children's rooms and faces and hair is a messy tangle and their clothes are scattered in piles all over the house. When I am not living love as fully as I always thought I would have as a mom (you know, before kids when you think you'll do it all right?)... When I function out of my tired mommy self rather than relying on God...and it SHOWS! And I need to learn to teach grace. To teach my girls how to be kind to one another, to be patient with each other, to forgive one another...not IF one of their sister's wrongs them or hurts them in some way, but WHEN...because it's going to happen. And the grace Scott and I must offer each other...constantly. Daily. It's hard sometimes, to be two people, with two different temperaments and personalities and ways of doing things. Sometimes we joke about how God must have looked down and thought it would be really humorous to put man and woman together in marriages just to see how poorly we would begin behaving...what silly (and not so silly) things we would fight about...how we would drive one another nuts...how our parenting ideas would differ...and our approach to stress and how we handle it would differ and how all of that would create fireworks of the not so pretty kind. So...Aubrey Grace...I love to say her name because it is a reminder of a gift we must offer to each other on a very, very regular basis. It is the salve that heals and mends and strengthens and restores relationships. There is something really amazing about grace.